Washington Post, 19 December 1969, p. B2. Baltimore Sun, 4 April 1883, p. 1. Baltimore Sun, 5 April 1883, p. 4. Washington Evening Star, 4 April 1899, p. 16. Washington Evening Star, 31 May 1873, p. 2. Alfred Hamilton, 45, plate printer. Alfred Hamilton, 45, married, plate printer, cannot write, b. in N.Y., parents b. in N.Y.
Lydia Hamilton, 30, wife, married, keeping house, b. in N.Y., parents b. in N.Y.
Clarence Hamilton, 3, son, b. in N.Y., parents b. in N.Y.
Washington Evening Star, 31 December 1885, p. 1. 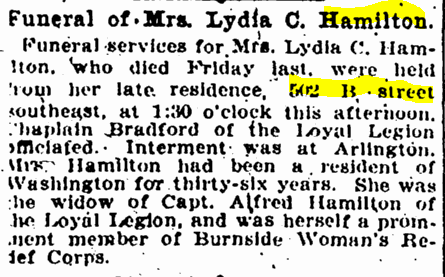 Lydia C. Hamilton, head, b. July 1843, 56, widow, mother of 1 child (living), b. in N.Y., parents b. in N.Y., owner of house. 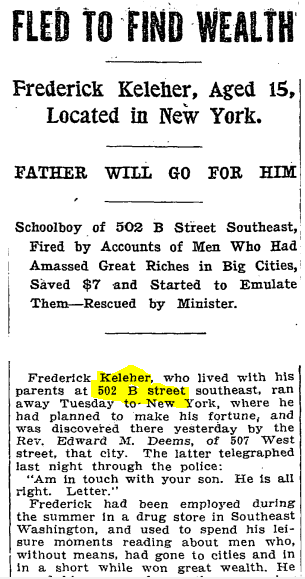 Washington Post, 2 July 1906, p. 12. 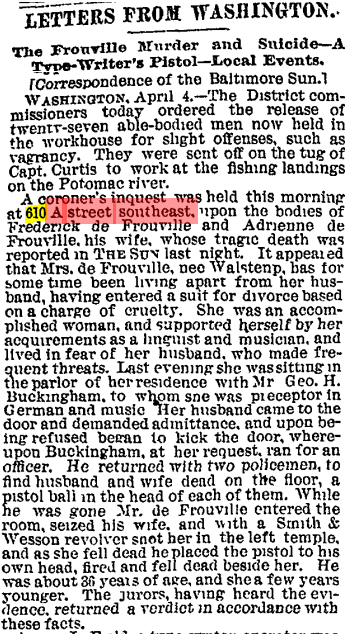 “Died.” 15 May 1909, p. 5. 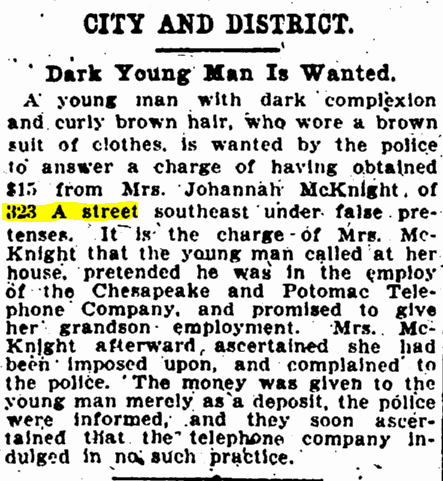 Washington Evening Star, 17 May 1909, p. 20. 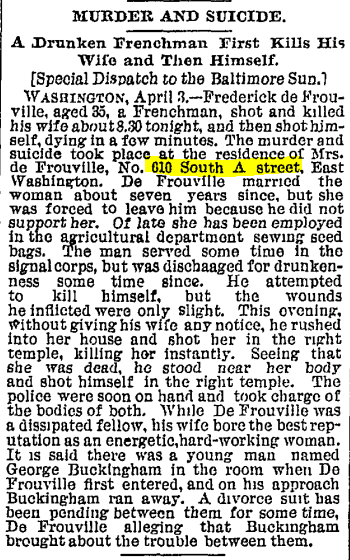 Washington Post, 12 October 1911, p. 2. Washington Evening Star, 9 March 1923, p. 5. 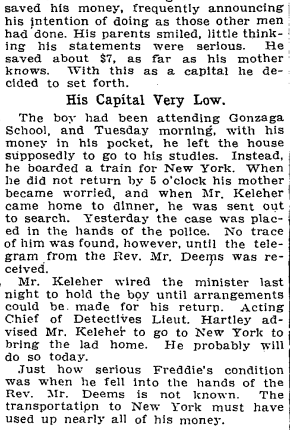 Washington Post, 3 May 1927, p. 22. Matilda B. Spalding, sister, 60, single, b. in Md., parents b. in Md., no occupation. Mary E. Spalding, sister, 70, single, b. in D.C., parents b. in Md., no occupation. L. A. Goley, head, rents ($30), 28, married at 24, b. in N.C., father b. in Switzerland, mother b. in Tenn., conductor, street railway. Catherine P. Goley, wife, 30, b. in Va., parents b. in Va., no occupation. 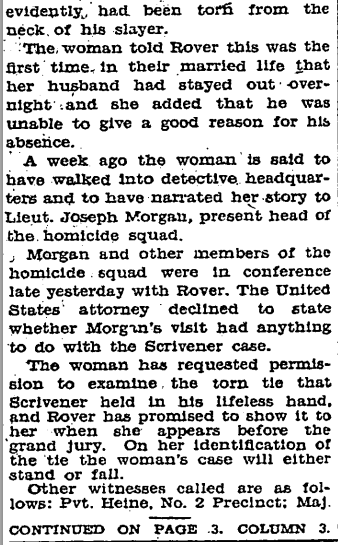 Louise M. Goley, daughter, 0, b. in D.C., father b. in N.C., mother b. in Va.
Washington Evening Star, 14 May 1936, p. 3. Matilda B. Spalding, owns property (worth $4,000), head, 80 [? ], single, completed 3rd grade, b. in D.C., lived in same house in 1935. Mary E. Spalding, sister, 88, single, completed 3rd grade, b. in D.C., lived in same house in 1935. Julia B. Spalding, sister, 76, single, completed 3rd grade, b. in D.C., lived in same house in 1935. James A. Lucas, rents ($40), head, 37, completed 8th grade, b. in Md., lived in Hyattsville, Md., in 1935, heat [?] salesman, Standard Oil Company. Mary Lucas, wife, 28, completed 12th grade, b. in Penn., lived in Hyattsville, Md., in 1935. James A. Lucas, Jr., 1, b. in D.C.
[Building permits.] Washington Evening Star, 1 June 1940, p. 26. 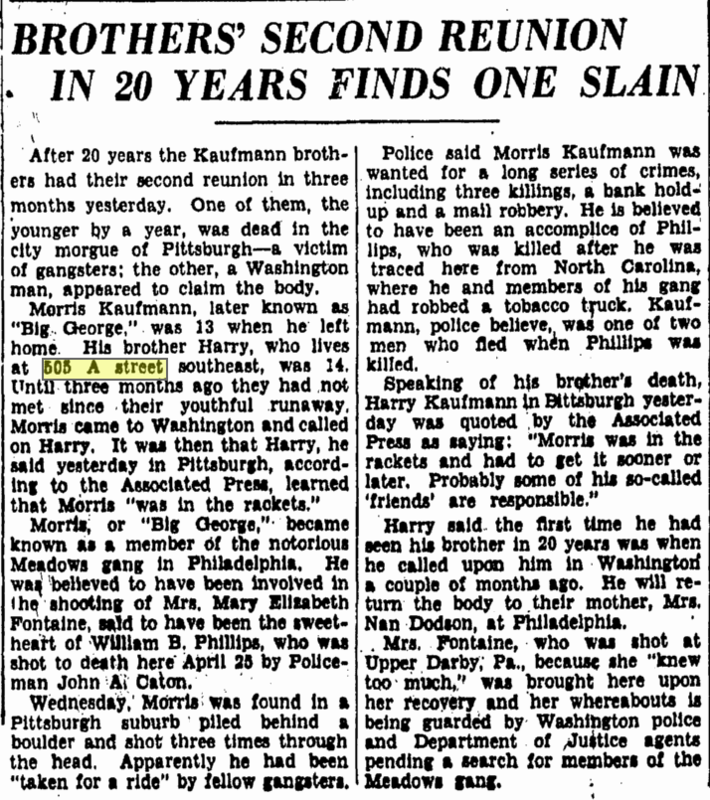 “Deaths.” Washington Evening Star, 28 January 1951, p. 28. 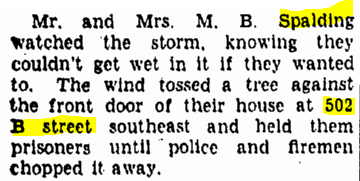 Washington Post, 24 August 1952, p. M10. 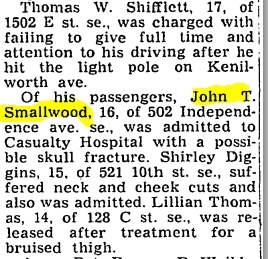 Washington Evening Star, 22 March 1964, p. 46. “Crime and Justice.” Washington Post, 30 November 1970, p. C7. Lamb, Yvonne Shinhoster. “Paul Leventhal; Led Nuclear Control Institute.” Washington Post, 14 April 2007, p. B6. Paul Leventhal, 69, founder of the Nuclear Control Institute in Washington and an expert in nuclear proliferation issues, died April 10 at his home in Chevy Chase. He had melanoma, a form of skin cancer. Since serving in the early 1970s as an aide on a Senate subcommittee chaired by Sen. Abraham Ribicoff (D-Conn.), Mr. Leventhal remained adamant about the dangers of nuclear terrorism and global commerce in plutonium — a key element used in nuclear weapons — and worked to prevent the spread of nuclear weapons to nations or groups. On the subcommittee, Mr. Leventhal worked on a Nixon administration bill to reorganize the Atomic Energy Commission. He described work on the legislation as a “baptism in fire” that changed his life. Mr. Leventhal, who worked in the Senate from 1972 to 1981, was responsible for the investigations and legislation that resulted in passage of two landmark nuclear laws — the Energy Reorganization Act of 1974, which split the Atomic Energy Commission into separate regulatory and promotional nuclear agencies, and the Nuclear Non- Proliferation Act of 1978, which established stricter controls on U.S. nuclear trade. The non-proliferation act’s requirement that countries accept international inspections on all their nuclear activities — “full- scope safeguards” — as a condition for receiving U.S. nuclear assistance eventually was adopted as an international norm by the multinational Nuclear Suppliers Group. Mr. Leventhal recognized the growth and threat of nuclear and bomb-grade materials, said lawyer Richard Wegman, who served as chief counsel for Ribicoff’s committee with Mr. Leventhal and later as counsel for the Nuclear Control Institute. In 1979, Mr. Leventhal served as co-director of the bipartisan Senate investigation of the Three Mile Island nuclear accident, and he prepared the “lessons-learned” legislation enacted in 1980 to require preventive measures and emergency planning. He lamented a few years ago that the flow of nuclear technology and materials from industrial countries to developing regions was continuing. “As a result, there is now more plutonium in civilian hands than in all of the nuclear weapons in the world. And some of it has already been turned into bombs, as in India, Pakistan and North Korea, while others have used or are now using civilian nuclear programs as a cover for weapons programs,” he said in a speech in 2001, adding that Iran and Iraq raised immediate concerns. In 1969, he came to Washington as a press secretary to Sen. Jacob K. Javits (R-N.Y.), served in 1970 as campaign press secretary to Sen. Charles Goodell (R-N.Y.) and two years later was a congressional correspondent for the National Journal. From 1972 to 1976, he concentrated on nuclear weapons proliferation as a research fellow at Harvard University’s Program for Science and International Affairs and as a visiting fellow at the Brookings Institution. From 1979 to 1981, he was staff director of the Senate Nuclear Regulation Subcommittee, chaired by Sen. Gary Hart (D-Colo.). After starting the Nuclear Control Institute, Mr. Leventhal served as its president for 22 years, lectured in a number of countries, organized conferences and wrote op-ed articles and books on nuclear terrorism, averting a Latin American nuclear arms race, nuclear power and the spread of nuclear weapons. For the past several years, he directed the institute as a Web- based program that maintains a word-searchable electronic archive at http://www.nci.org and a collection of institute and Senate papers spanning more than 30 years at the National Security Archive. Survivors include his wife, Sharon Tanzer Leventhal of Chevy Chase; two sons, Theodore Leventhal of Washington and Joshua Leventhal of Raleigh, N.C; a brother; and two grandsons. “Fights Galore in Day Will Keep Court Busy.” Washington Evening Star, 1 September 1912, p. 22. 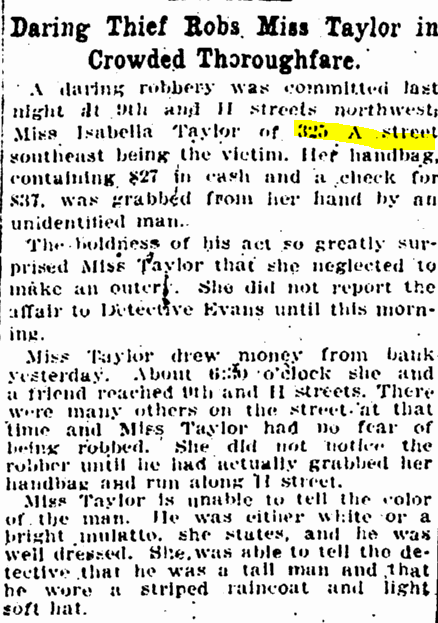 Washington Evening Star, 15 December 1909, p. 19. Washington Evening Star, 1 August 1908, p. 16. 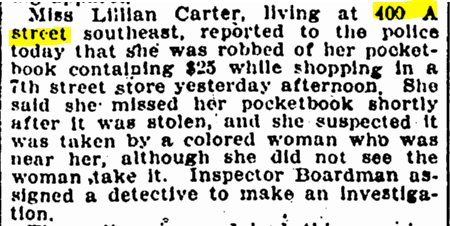 “Other Robberies Reported.” Washington Evening Star, 7 December 1907, p. 1. 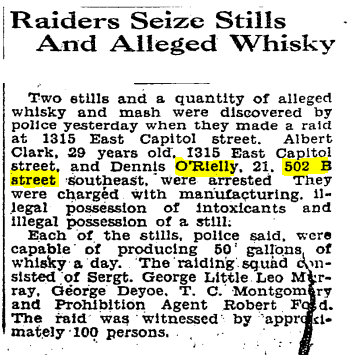 Washington Evening Star, 27 May 1934, p. 21. 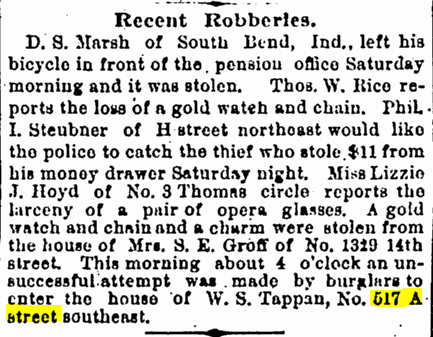 “Robberies Reported.” Washington Evening Star, 22 August 1888, p. 3. 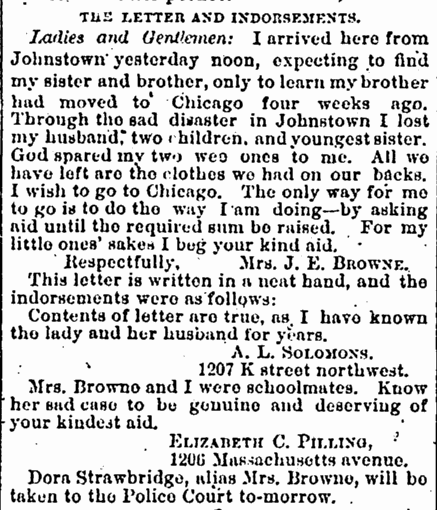 Washington Evening Star, 17 November 1887, p. 5. Washington Evening Star, 31 December 1886, p. 3. 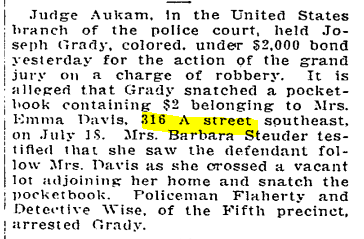 “Police News Notes of a Day.” Washington Post, 9 July 1915, p. 14. 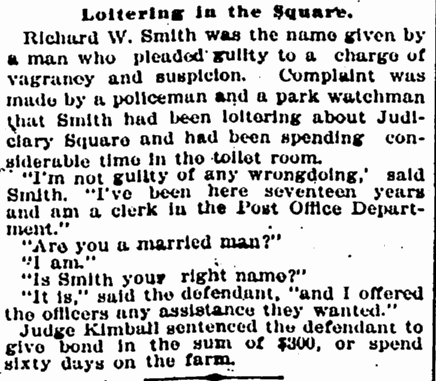 “District Court News.” Washington Post, 27 July 1915, p. 5. 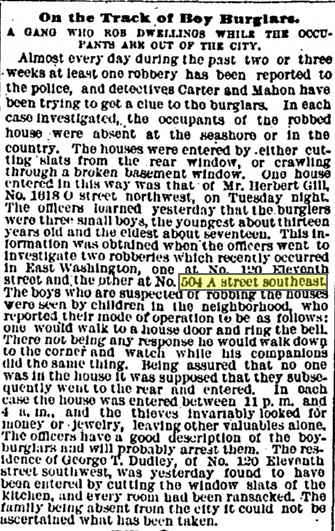 “Robberies in Washington Reported in Last Seven Days.” Washington Post, 2 February 1910, p. 2. 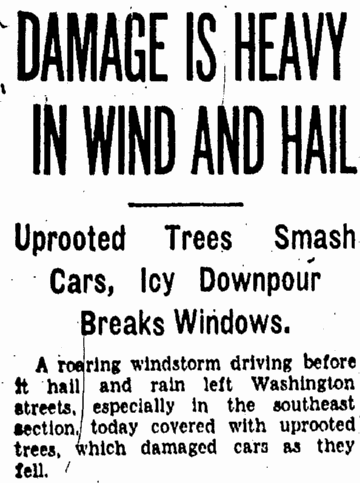 Washington Post, 30 November 1929, p. 1. 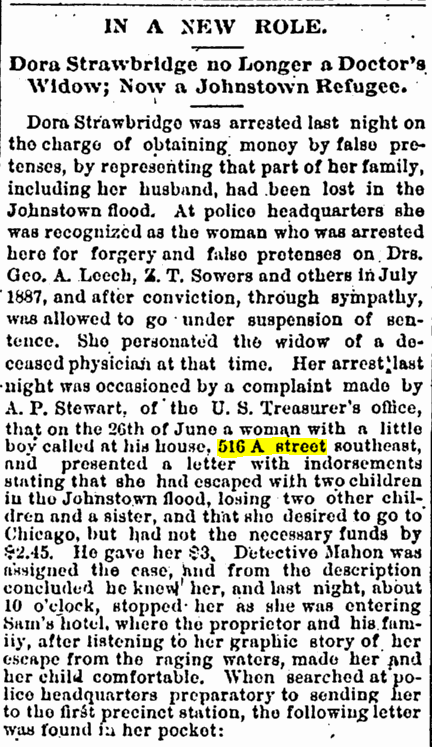 Washington Evening Star, 21 July 1887, p. 4. 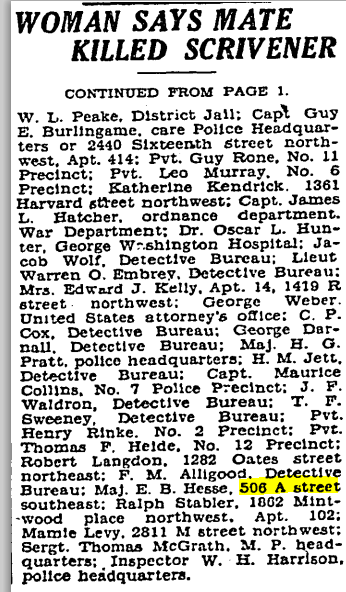 “Police News Notes.” Washington Post, 25 June 1916, p. 18. “These robberies were reported to the police yesterday: . 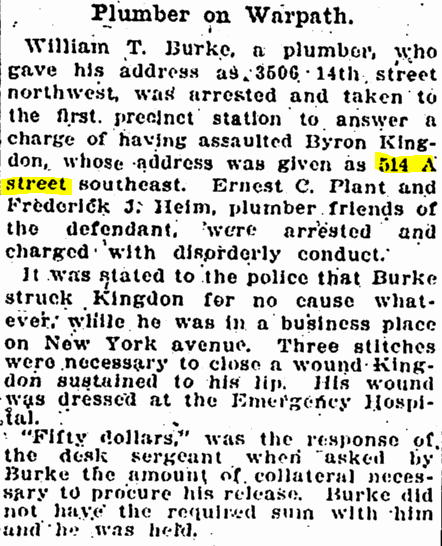 . .
“Police News Notes.” Washington Post, 27 July 1914, p. 12.